One out of three pets will get lost at some point in their lives. This statistic strikes fear in all pet owners, but there are services and strategies to boost your odds of finding your dog or cat. From simple to high tech, here are 10 things you can do to help bring a missing pet home safely. 1. Collar and ID Tags. Only 2 percent of cats and 15 percent of dogs without tags or microchips will be reunited with their owners, states the American Humane Association. So make sure your cat or dog is wearing a collar and identification tag that bears your current contact information, including phone number. 2. Microchips. Many different companies manufacture pet microchips, which are read with scanners provided to veterinarians, animal control agencies and shelters, etc. According to the American Microchip Advisory Council for Animals, it is best to pick a microchip that operates at the American standard of 125 kilohertz. Be sure to register your contact information and keep the information up to date. Many microchip companies will now accept registration information for another manufacturer's microchip, so consider cross-registering you and your pet with several different microchip databases. 3. Use GPS to locate your pet. Satellite technology can be used to track your pet's movements inside and outside your house -- provided your cat or dog is wearing a special GPS-enabled collar. If your pet should go missing, products such as the SpotLight GPS Locater can locate your pet with "pinpoint accuracy" anywhere in the U.S. The RoamEO Pet Location System is another device that uses GPS to track pets. 4. Distribute "Lost Pet" fliers and posters. Nothing beats good old-fashioned footwork when it comes to finding a lost pet. 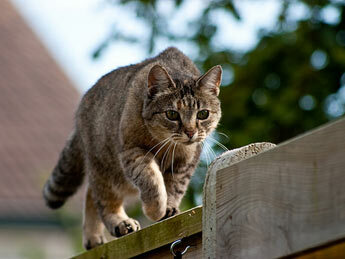 Get outside and scour the neighborhood; knock on neighbors' doors and call your pet's name. Time is of the essence, so don't wait to see if your pet will return on its own. Make fliers and posters bearing a color photograph of your pet and include a description of your pet, when and where it was last seen, and your phone number and email address. Don't include your name or home address for safety reasons. Post them at local businesses and veterinary offices and give them to your local letter carriers who travel extensively through the neighborhood. According to pet detective Kat Albrecht, dogs are more likely to roam farther from home and be picked up by a Good Samaritan, while cats usually stay within the immediate area. Consider offering a reward, but beware of getting scammed. 5. Visit local animal control agencies and shelters. File a lost pet report with all animal shelters and animal control agencies within a 60-mile radius of where your pet was lost, recommends the Humane Society of the United States. If your town has no animal control agency, contact the local police department. It's also important to personally visit all shelters and animal control agencies within a 20-mile radius at least every other day, states Albrecht on her Missing Pet Partnership website." 7. Broadcast it on the internet. Sounding the alarm via Facebook, Twitter and other social networking sites can work. Just ask Shane and Nicole Meide of Minnesota, who found their lost cat through Facebook. 9. Set out a humane trap. You can also try luring your lost pet home using a humane trap that is filled with your pet's favorite food, treats or an item of clothing that smells like you and can capture the animal without harm. That's how Rue the Chihuahua was finally caught after 19 nerve-wracking days of being missing in a Florida swamp. 10. Hire a professional pet detective. You can always enlist professional help by hiring a licensed and certified pet detective. Albrecht's Missing Pet Partnership organization provides a national directory of reputable pet detectives who have undergone Missing Animal Response (MAR) training. Finally, do not give up! That's the message Florida resident Tracie Steger posted on Craigslist after her cat Giggle-Blizzard crawled home on two broken legs after nearly two weeks of being missing. Be persistent -- and visible. "Posters and fliers are the number-one way animals get recovered," animal tracker, Laura Totis, told Paw Nation. Very informative, thank you for sharing these tips. So... last time JD decided to go off exploring.... in 35 minutes he managed to get 2 1/2 miles from home... this is the dog who insists on being carried home from his walks... And yes... generally speaking dogs do travel in circles.